She might have stumbled into the sport by accident (she was sent as a replacement at a college-level shooting competition), but Mumbai-born Anjali Bhagwat is one of the country’s most prolific female air rifle shooters today. Armed with her trusty Feinwerkbau air rifle, she has racked up an impressive gold medal tally over the course of her career and secured the much-sought-after world number one rank in the 10-metre air rifle event in 2002. 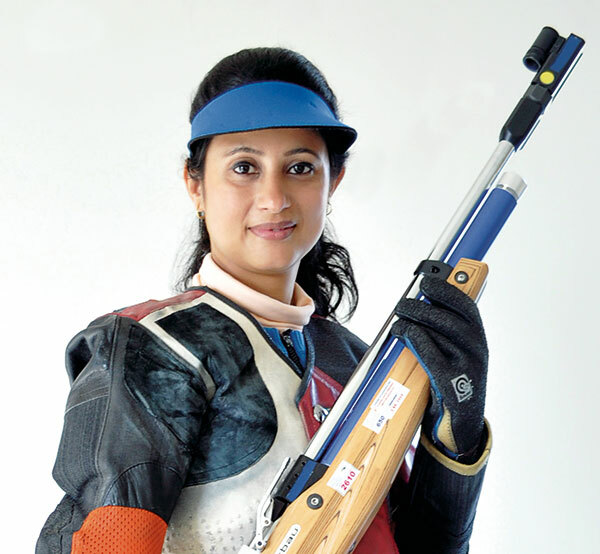 After close to three decades of representing the country in competitive shooting, the winner of the Arjuna Award and Rajiv Gandhi Khel Ratna today devotes her time to coaching young shooters at the Anjali Bhagwat Shooting Academy (ABSA) in Pune…good thing because she gets jittery if she goes a day without touching her rifle! It’s an individual sport, so everything depends on your pace and effort. How much command you have over your subconscious mind is what is important, and I like that kind of test. When I started out, we had only two weapons — and those were also old models — so our ammunition would rarely reach the target. We were made to wear special customised outer gear, but I didn’t know the advantages they came with. We didn’t have any technical know-how either, because shooting was a new event for India. It took me eight years to win my first individual medal! I am so happy that I am pursuing a career that I am genuinely passionate about. This is my passion and I feel that I still have that zest of competing and winning even after 27 to 28 years. On the flip side, I tend to be a little too emotional. My son has taught me how to deal with youngsters. I have learnt that small kids have big egos. Each student’s nature and thought process is different. I’ve learnt that you can’t go bossing them around because they will not accept it. You have to be their friend and build a rapport with them.